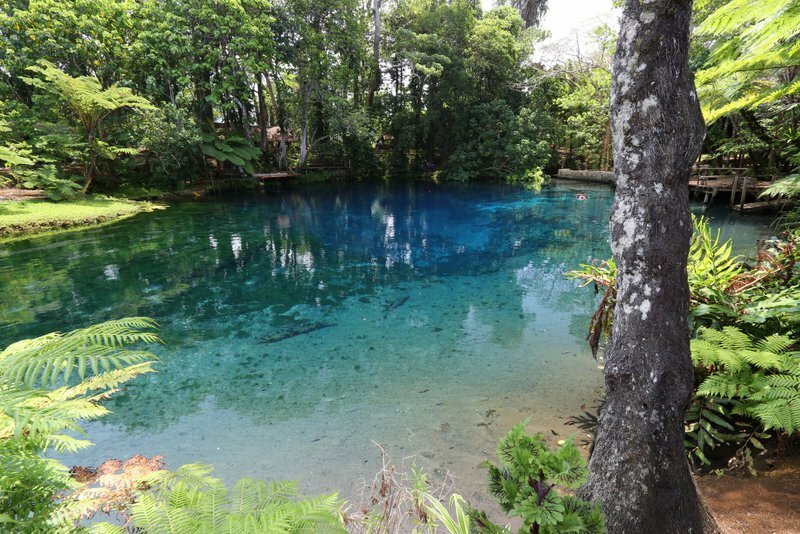 Turtle Bay and surrounds is the only place in Vanuatu where there are not one but three incredible “blue holes” within a few kilometres of each other. In fact the east coast of Santo boasts more blue holes than anywhere else in the world! Santo blue holes are naturally occurring limestone springs. They are fed by incredibly pure freshwater flowing underground from huge mountains in the centre the island (over 50 km away). A crystal clear blue river meanders from each blue hole to the sea. The first and closest, Matevulu, is the largest of Santo blue holes and is only a short 45 minute paddle away, directly opposite Oyster Island Resort. Paddling up the crystal river to reach the swimming lagoon is an experience in itself – like being lost in the Amazon! It takes about 30 minutes to paddle up the river (you can also drive direct to the blue hole – just follow the signs from the highway). Once at the blue hole you are rewarded at the end with a great swimming area and a giant rope swing tied onto a large banyan tree. There are also toilets there. Cost is 500vt per person. Note – lately, this particular blue hole has become turbid and not as clear as it once was (perhaps due to a drought which occurred in 2016) so please check with locals/tour guides on arrival to find out its condition. The second, Ri Ri, is by far the prettiest blue hole/crystal river out of all the Santo blue holes. It is another 45 minute paddle farther south of Matevulu Blue Hole. Paddling up the entrance lagoon and crystal river is nothing short of magical! You can also visit both these blue holes by car as well, and at Ri Ri Blue hole you can choose to have locals paddle you up via outrigger canoe (ask the locals near the bridge going over the Ri Ri river). The locals have gone to a lot of effort to provide platforms, bathrooms and change areas to make this blue hole easily accessible. Cost is 500vt per person. The third blue hole, Nanda or Jackie’s Blue Hole is located at the top of Turtle Bay (about 1.5 – 2hr paddle north of the house). You can kayak there from the house however it is a long paddle (2hrs +) and only recommended for experienced sea kayakers. Make sure to paddle up the river on an incoming high tide (stay to the left) – its about 4km to reach the blue hole but its’ definitely worth the effort (like being in the Amazon without the crocs or nasties).Jackie’s Blue Hole can also be reached by car (approx. 6-8 min. drive past Turtle Bay) and features a small cafe. It costs a little more for the entry fee than other Santo blue holes (1000vt vs 500vt for the others) but you do get a free coffee/tea and cake with entry. Note – there is now a second entrance to Nanda Blue Hole – just south of the main entrance – but this is not the actual blue hole – just a section of the river leading away from it – operated by a different custom owner! Still nice for a swim but nothing like the real thing. The next nearest blue hole is farther south, opposite the Lope Lope Lodge. It is called Cirad Blue Hole and you reach it by following the first dirt road on the left just south of Lope Lope. Drive on this road for about half a kilometre (it is on the right just before the big house). This is not a “tourist” blue hole so you must seek permission from the landowner to swim in it. As Santo blue holes go, this is much smaller and shallower than the others but still very pretty! Finally there are a few more “hidden” Santo blue holes farther north along the coastline that are also worth exploring. The first one (which we call the Secret Blue Hole or Hog Harbour Blue Hole) is located about 1.4 km after the turn-off to Champagne Beach – there’s no sign just a hut and some seats on the right hand side of the road with a track leading down to the swimming lagoon. It is one of the only Santo blue holes with a direct connection to the ocean. More “secret” blue holes can be found by turning left at the T-intersection just past the village of Port Olry, and continuing about 1.8km down the dirt road. There are apparently two blue holes here – one called Vatvateur and the other Vatvatel Blue Hole. Again you will need to check with the local landowner or custom owner to see if you can swim in them as they are located on private property. The road leading to this area is extremely rough and only suitable for 4WDs. This is a huge blue hole is located right in the middle of Malo Island’s north facing coastline (directly opposite Aore Island and Ratua Island). 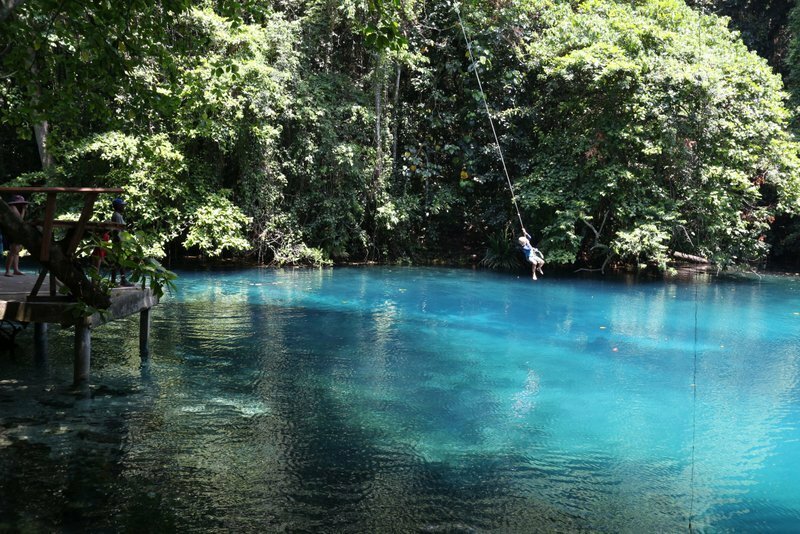 It is probably the most natural of Santo blue holes, very cool and refreshing and quite deep. The crystal river flowing out of the blue hole is stunning and leads to a shallow turquoise entrance lagoon framed by a small island (very, very pretty). You can access the blue hole by catching a boat over to Malo and then asking one of the locals with a 4WD to take you there. Alternatively if you are staying at either Ratua Island Resort or Bokissa Island Resort they can organise a kayak trip up the river to the blue hole. Nearly all of Santo blue holes require you to pay an entrance fee to the local landowner (about $5 AUD per person) so make sure to take some cash with you. You're one step closer to joining us on our beautiful island home in paradise, so go ahead, book now!